Made in China is popular in the world for years. However, the image of Made in China has been judged and recognized as low quality, Chinese mold suppliers faced the questioning from oversea mold buyers and suffered from faith-lack. To ensure the mold quality, there are some main processes need to pay attention to. The capacity of China steel factory still cannot meet the needs of mold making industrial, the steel used in mold making are mostly high standards and special steel, it's a basic element to build high quality molds, however, some mold factories fail to get genuine steel if they happen to deal with the steel vendor without honesty. It's very important to use reliable sources for steel. Currently, LKM is the largest steel and mold base producer in China and recognized as a quality guaranteed supplier, and there are some other agents of European brand in China. It's a trend to invest on research and development in mold making technology, for the past 30 years, China mold making capacity is basically gained from coping the way of developing countries. 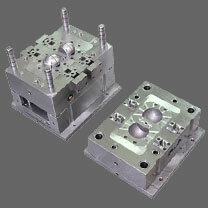 China mold factories rely heavily on the import machining equipment and CAD/CAE/CAM technology. Along with Chinese economic fast growing, some of the Chinese mold factories realized the shortages and noticed the big devolving space, it's happy to see that in the earliest future made in China becomes to create in China. People might have an impression that China is full of cheap human resources. The truth is we do have lots of labors but we are seriously lack of skillful mold makers. It takes years to have well trained mold making technicians and engineers, we have to leave this problem to time. It is a long way to go to change the impression about China mold quality and it needs all the China mold manufactures to take their own responsibilities.